If you tried to judge whether the 2008-2009 winter in the Northern Hemisphere was colder or milder than usual based on the conditions where you lived, it would be something like the ancient Indian story of the blind men and the elephant. If you couldn’t see the whole elephant, and you could only touch its leg, or its trunk, or its ears, would you be able to understand the whole creature? Our local weather provides us a similarly limited view of what is happening to the weather or climate on a global scale. 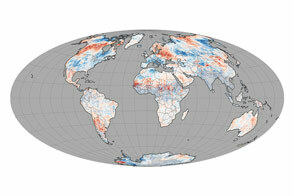 That point is illustrated by this land surface temperature anomaly map spanning the three months of meteorological: December 2008-February 2009. 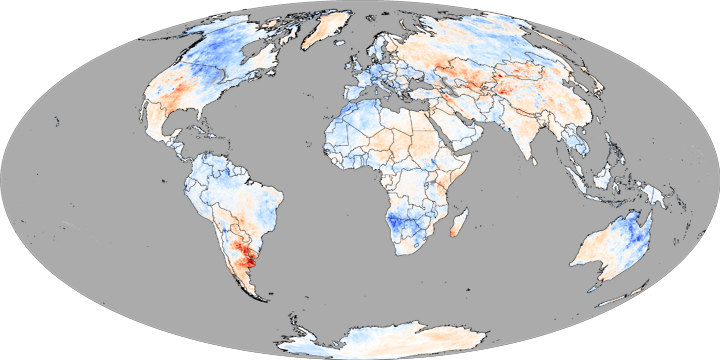 Based on data from the Moderate Resolution Imaging Spectroradiometer (MODIS) on NASA’s Terra satellite, the map shows places where the winter was warmer than the 2000-2008 average as red, places where temperatures were near-average as white, and places that were colder than the average as blue. Across most of Canada and the eastern United States, land surface temperatures were several degrees cooler than the average of roughly the past decade, while temperatures in the Great Plains and the South were above average. Across the Atlantic, western Europe and eastern Russia were cooler than average, but a broad swath of warmer-than-average temperatures stretched from eastern Scandinavia southeastward through western Russia, across central Asia, and down into southern China. In the Southern Hemisphere, Argentina was experiencing devastating summer drought; the failure of crops and parched vegetation are probably responsible for the elevated land surface temperatures there. Meanwhile, the cold temperatures across northern Australia probably resulted from unusually heavy rains and flooding. To view animations of monthly anomalies from March 2000 through March 2009, please see Global Maps: Land Surface Temperature. NASA image created by Jesse Allen, using data provided by the Land Processes Distributed Active Archive Center (LPDAAC). Caption by Rebecca Lindsey. 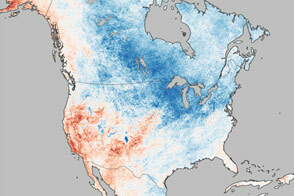 This land surface temperature anomaly map spans the three months of meteorological winter: December 2008-February 2009.